Named in honour of the iconic inhabitant of Canada’s north, this is our first club tournament of the new year. All our club tournaments are rated by the Chess Federation of Canada, so participants are members of CFC as well as of our club. To ensure competitive play, we group players by CFC rating. Accordingly, we have Crown, U1900, and U1500 sections. The Crown section is also rated by the World Chess Federation, FIDE. Tournament games are played on successive Monday nights at 7:30 pm. Each player has 90 minutes for all her or his moves, with a time increment: an extra 30 seconds is added before each move. Complete final results are posted below the round-by-round reports. After a brief AGM, the tournament got started at around 8:00 pm. Welcome to all the new members in our organizational team! Thirty-four players joined in Round 1, a somewhat lower number compared to previous tournaments – perhaps some of our regulars were “chessed out” after the Hart House Winter Open last weekend. The casual section, however, featured quite a few new faces – getting into chess shape seems to have been on a few folks’ lists of new year’s resolutions! Round 1 is really too early to announce leaders, but NM Geordie Derraugh (one of our club’s arbiters and the winner of our last club tournament) currently stands atop the leader group. In the U1900 section, Ulli Diemer, who declined the promotion to the top section, lost his Round-1 game to George Supol (our new club treasurer). In the U1500 section, Shabnam Abbarin (who has been tirelessly keeping our books in order for the past several months) lost her Round-1 game in an upset win by Eli Teram. Complete standings are on the cross-tables below. Arbiter Alex Ferreira got the tournament started pretty much on time, shortly after 7:30 pm. There were a few latecomers, but everyone showed up. A few new players joined in, but some Round-1 players took byes, so our tournament numbers were pretty steady. Meanwhile, our casual section was jam-packed – and extra-strong. Pretty soon, the casual section’s going to take up the length of the hall! With a few byes among the leading group in the top section, David Southam has emerged in clear first with 2.0/2. In the middle section, Atharva Washimkar and Miroslav Stefanovic are tied for the lead with 2.0/2. And the bottom section, Arhant Washimkar and Vinorth Vigneswaramoorthy (our new marketing director) are tied for the lead with 2.0/2. It’s a good tournament so far for the brothers Washimkar! Current section leaders are David Southam in the Crown section, Miroslav Stefanovic in the U1900, and Arhant Washimkar in the U1500. Before the round, we had a raffle for a pair of Leafs tickets. Thanks to all who participated; we raised $260 for the club! Tournament section leaders stayed strong, with David Southam (Crown), Miroslav Stefanovic (U1900), and Arhant Washimkar (U1500) all holding their leads going into the last round. See complete standings, below. Everybody loves to watch Harmony’s games. Her game against me (which I was lucky enough to win) was the object of some extensive analysis at the Pump (our ACC clubhouse) after Round 4. In the top section, club champion FM Michael Humphreys pulled off a come-from-behind sprint to the finish to win clear first with 4.0/5 – while Pavel Peev played a supporting “spoiler” role by holding leader David Southam to second place with 3.5/5. In the bottom two sections, both leaders finished perfect with 5.0/5. Congratulations, Miroslav Stefanovic (U1900) and Arhant Washimkar (U1500)! Honourable mention goes to Josep Sobrepere for a second-place finish in the U1900 with 4.0/5, and to Eli Teram for a second-place finish in the U1500 with 3.5/5. See complete standings, below. 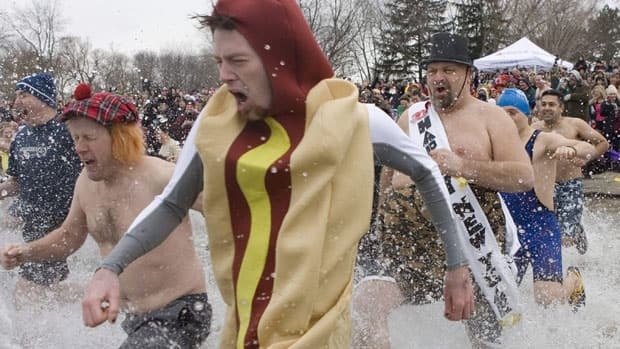 It’s a New Year’s tradition for Canadian “polar bears” to wade into freezing waters on the first day of the year. Check the CBC article for more pictures and details.